Minutes provided courtesy of the club Secretary, Mr. Dennis Harwell. Call to order: The meeting was called to order at 1722 by Dennis Mathis. •	The elections were conducted by Clint Logwood and were held in the MFC Clubhouse shortly after 1700, before the start of the general membership meeting. •	The existing Board members had all indicated that they were willing to serve on the Board for another year. There were no nominations for additional Board candidates from the floor, and Mr. Logwood then requested that a motion be made to close the nominations. Tom Hubert made the motion, and Robert McEnaney seconded the motion. •	The Majors Flying Club Board of Directors (BOD) were unanimously re-elected by the regular members present. •	Ty Helton, the Majors Field General Aviation Manager. 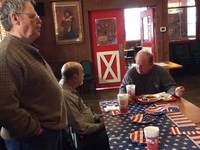 •	Ty Helton and James Finley, for rearranging furniture and setting up additional chairs in the Terminal Building for the meeting. •	Joe Rector, for supplying the pizzas that were served. •	Tom Hubert, for recording the meeting on video. •	Denis Rottler, for additional “right-hand man” assistance. •	Brad and Karen Smith, for putting the evening speaker’s program together. •	Usually, multiple factors combine to cause an accident. •	The “I’M SAFE” principle: Illness, Medication, Stress, Alcohol, Fatigue, and Emotion (or sometimes, Eating). •	Fuel Management: Plan on arriving at your destination with one hour of fuel remaining. o	Know your fuel burn rate. Don’t trust your fuel level indicator. •	Proficiency: See the Club operations rules on proficiency. Try to fly at least one per month, with at least three takeoffs and landings. •	Collision Avoidance: Keep your eyes outside of the airplane. See and avoid air traffic. •	There is an Accident Response Checklist in both aircraft. They are in the aircraft logbooks, just in case. •	Mr. Armstrong will be sending out a questionnaire via e-mail, and asked that everyone respond. •	B.J. Finney provided a handout with a summary of the Club’s income and major expenses for 2017, which was discussed. •	Dennis Harwell provided a capsule summary of the minutes from the last General Membership Meeting, which was held on 28 September, 2017. •	Mr. Harwell announced that the new club membership cards were available to be handed out at the meeting. 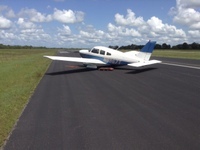 •	Dennis Guinn announced that the Cessna is currently unavailable because it is undergoing its annual inspection. It is hoped to be available next week, after some parts (on order) arrive. •	Mr. Guinn also announced that the Archer will be getting a new engine during its annual inspection in March. Some small issues with the Archer will be looked at during the annual. 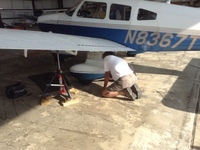 •	Both aircraft will have engine oil pan heaters installed during their annual inspections. These will make oil changes and winter starts much easier. o	The Aircraft Salvage of Dallas (ASOD) tour Fly-Out in January was attempted, but scrubbed due to weather. o	Choctaw/Durant, Oklahoma Fly-Out in February had three or four aircraft flying for the event. 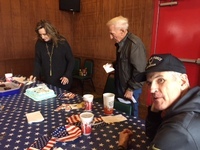 o	The Wash and Wax party for both aircraft in March had good attendance and good food. o	The Mount Pleasant Fly-Out to the Mid-America Flight Museum in June was enjoyed by many. o	The Landing Proficiency Seminar with Mike Montefusco in August was well attended. o	For this year, Mr. Rottler handed out a survey sheet, soliciting suggestions for upcoming events. •	Taxiway Lighting Project: Mr. Mathis announced that this is currently underway, and is expected to be completed by the end of March. We may also get Pilot-Controlled Lighting (PCL), but this is not known for certain. •	WINGS Program: Mr. Mathis also spoke about the FAA WINGS program, which can make flight reviews easier. o	Start the program one year before your next flight review is due. o	You need to complete three knowledge courses and three flight activities with an instructor. The flight activities are fairly short, usually less than one hour each. o	Upon completion, your next flight review due date is then advanced by two years. o	Learn about the WINGS program at FAASafety.gov. •	Dennis Mathis announced that Nathaniel Bennett soloed at the end of December. •	Mr. Mathis also announced that Zach Miller and Josh Stone recently soloed. •	Our Guest Speaker for the evening was Brad Smith, the DPE at Majors Field. He presented an interesting program about his aviation career, which spanned the Military, Commercial, Airlines, and General Aviation realms, finishing with some interesting stories of some of his experiences as a DPE. 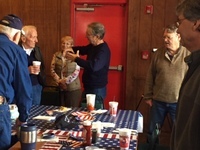 •	Mr. Smith was presented with a customized “Thank-You” coffee mug after his talk. The meeting was adjourned by Dennis Mathis at 1859. The 3rd quarter Membership meeting was held in the Majors Flying Club hangar on Thursday, September 28, 2017. The well attended event featured burgers and brats courtesy of Chef Rector, a Safety Briefing by Chief Pilot & Safety Officer Mark Armstrong, a Treasurer's report from the Treasurer B.J. 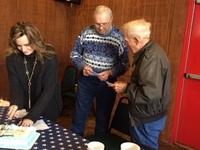 FInney, a report from the Secretary, Dennis Harwell, an aircraft status report from the Maintenance Officer, Dennis Guinn, recognition of Mr. Young Lee earning his Private Pilot certificate, and best of all, Part Two of Mr. Dennis Mathis' Air Force career. A while back, Mr. Mathis was the guest speaker for one of our membership meetings. At that time, he shared his experiences and stories about Part One of his Air Force career. Fortunately, Mr. Mathis agreed to finish his story and presented Part Two (1965-1980) of his Air Force career tonight. This period of his career was after his stint as a Navigator and his transition to a pilot. 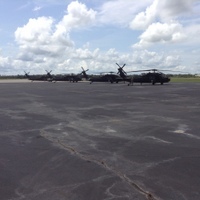 He has time in T-41's (C172F), T37B Tweet, T-38A Talon, the T7A Caribou and several others. Several of his assignments in the late 1960's to mid 1970's were in Southeast Asia. It is always fascinating to hear these real life stories and experiences and to be reminded of what others have given to this country to make it safe for the rest of us. 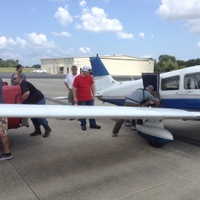 The club's Archer participated in Operation Airdrop with a flight to Beaumont Municipal airport (KBMT) yesterday. Lets just say it started off with a BANG! 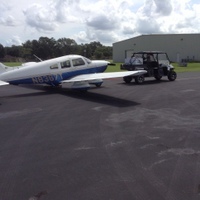 Denis Rottler and I flew the Archer, loaded with about 150 lbs of supplies, to KBMT. We took off at 0915 and after an uneventful 2 hr flight, we touched down on runway 31 and discovered that our left main tire was flat. Without going into too much detail, the FBO and some very helpful Army folks, helped get the aircraft off the runway and towed to the hangar. (thank you Joey and Bret). The FBO was able to roundup an old used tire, sold us a new tube, and with the help of Phil Robertson (an A&P at Liberty airport), we were headed back to Greenville by 1830, arriving at 2045. Thank you Phil. The ladies coordinating the distribution of the relief supplies at KBMT are truly amazing. I'm calling them the BEAUMONT ANGELS because of the work they are doing. For the 7 hours Denis and I were at the FBO, we witnessed them on the telephone almost constantly coordinating the delivery and pick up of supplies and working with people seeking supplies coming into the FBO all afternoon. The support and the genuine desire of folks helping the victims of hurricane Harvey was truly amazing. Disasters such as this bring out the best in people. After months of planning and coordination, an event we starting talking about in March of this year, finally came to fruition on Saturday, August 12, 2017. The Landing Proficiency Seminar was a well attended, informative, and a very professionally conducted seminar. We used marketing and advertising forums to promote this event similar to what we used for the November 2016 Breakfast Fly-In. All of the local airports and EAA Chapters were emailed a copy of the flyer and asked to post it. A Facebook event was created and was spread around (liked and shared) by our good friend from Mineola-Wisener (3F9), Lupita Wisener. In all we registered thirty-seven folks for the event. Of those thirty-seven folks about half of them were from Greenville and/or are Majors Flying Club members. The remainder were from Sulphur Springs, Mineola-Wisener, McKinney, Rockwall, and Emory. We were expecting five fly-in airplanes but due to mechanical issues and weather only two airplanes were able to fly in. Mandy and Carl Brown from the local EAA Chapter (neither the EAA nor the local EAA Chapter were affiliated with this event) greeted our guests at the registration desk. In addition to passing out City of Greenville goody bags and checking in our guests, they passed out raffle tickets and collected contact information for Mike Montefusco. The Fuel Reimbursement table, adjacent to the Registration table, was manned by none other than our own Joe Rector. Joe wasn't very busy but like a true sailor, he knew how to pretend. In the end, thirty-six folks signed in and attended the seminar. The City of Greenville and the Majors Aviation Manager, Mr. Ty Helton, provided the shuttle vehicle and the shuttle driver service between the FBO and the L-3 Rec Hall for those folks who flew in or chose to park their vehicles at the airport. Thanks Ty. Thanks to our generous sponsors, local dentists Dr. Jackson Bean of Complete Dental Care and Dr. Jeff Nelson of North Texas Dental Care, we were able to provide our guests with catered Subway sandwiches, chips, fruit, tea, water, and cookies. Many thanks to our generous sponsors for a very well received lunch. The L-3 Rec Hall was set up with a "help yourself" serving line as well as several circular tables for eating and telling lies. Lunch was available starting at 11:30 a.m. and folks didn't have to be asked twice. There was quite a bit of camaraderie going on at those tables between munching on sandwiches, watching Mike Montefusco's videos, and the ever present hangar flying talk. The President of the Majors Flying Club, Mr. Mathis, made some introductory remarks and welcomed our guests prior to the start of lunch. 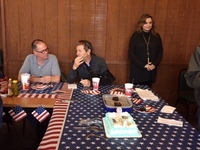 Around 12:30 p.m. when all of the sandwiches had been consumed, Mr. Mathis got the program rolling by conducting the raffle. Thanks to Gordon Hay, we had two very nice stainless steel, insulated tumblers to give away. We also had a $50 gift certificate for Sporty's and one for Aircraft Spruce to give away. With the crowd all stirred up, Mr. Mathis introduced our guest speaker, Mr. Mike Montefusco. Mike is a former L-3 employee and is at least partially responsible for starting the very successful Private Pilot Ground School program hosted annually by the MFC. Mike is a very experienced and professional speaker. As a bonus, Mike invited Larry Cross from Aviation Performance Solutions in Arlington to talk a bit about their Upset Prevention and Recovery program. Larry had some interesting (unsettling) video and sobering accident statistics as they relate to the cause of the highest number of accidents for general aviation. He gave a short slide presentation that was both informative and eye opening. We have been invited to make APS a destination for one of our Majors Field Flyout events and it seems like it would be a very interesting trip. Mike gave us a bit more than just Landing Proficiency tips as part of his presentation. We received a taste of his training mindset and his use of acronyms to reinforce those ideas. His tips for being mentally prepared for alternate outcomes instead of what "normally" happens was excellent food for thought. Will you ever be able to forget "ETOISARTO", "ELISAGA", and "EIAISAMA"? I think not. Mike discussed Landing Proficiency, with regard to being prepared and having go/no go decision points, in a similar manner. He discussed his method for knowing your position, speed, and configuration at various "gates" in order to make stabilized approaches and landings or to be used as no/no go decisions points. As usual, his presentation was energized, professional, and information. Well done and thank you Mike. Based on the feedback, the attendance, and the willingness of Mr. Montefusco to present another program in the future, we will likely look at hosting another seminar in 2018. Many thank to the volunteers who showed up early to help set up and who stayed after the seminar to help clean up. Like most things, it takes a village to pull these events off and the help is greatly appreciated. If you haven't volunteered to help with one of our MFC events, please consider volunteering for the next one (we can never have too many volunteers!). The Majors Field Flyout to the Mid America Flight Museum at the Mt. Pleasant airfield (KOSA) was a well attended and very enjoyable event. Scott Glover is the owner and ringleader of the museum and he and his staff of volunteers could not be more welcoming and accommodating. We have been working with Scott for several months trying to arrange this visit. They are now open on Saturdays from 10 a.m. - 2 p.m. which made it much easier to schedule a trip. For several mornings prior to Saturday, the skies had been overcast. Friday morning was clear so we were hopeful but of course there was some cloud cover on Saturday morning. The ceiling was high enough to launch at 0900 from KGVT although the cloud cover at about 10 NM west of KOSA required descending through a clearing to a lower altitude for the last segment of the trip. The flight home was uneventful but not exactly cool at the lower altitudes caused by cloud cover. Word is the Cessna found clear skies and cooler temperatures at 4,500 ft. The morning started with fourteen (14) folks and five (5) airplanes signed up to make the trip. Actually it was only four (4) airplanes. On Friday evening it was decided that a lack of parts was going to prevent the Harvest Aviation Cherokee 140 from being airworthy. Some scrambling ensued Saturday morning trying to figure out how to get everyone in a plane. Bob Thomas was asked to stop by Majors from Caddo Mills in his C-170 in case we needed his two spare seats and ten (10) gallons of fuel was pulled off the Archer to give us a bit more useful load. By the way, be very nervous if you see Tom Hubert walking around with an Arkansas credit card. As it turns out several personal issues and some changes of heart occurred before 0900 and with a total of ten (10) folks flying and four (4) airplanes (the two club planes, the Price's Cherokee 180, and Bob's C-170 from Caddo Mills), we were able to get everyone on a plane and no one had to drive. It was a great tour. So many beautiful vintage and WWII airplanes and such an enthusiastic group of volunteers giving the tours makes it a great way to spend a couple of hours. Many thanks to Scott Glover and company. The KOSA staff deserves a shout out as well. We talked with the manager, Paul Henderson, several times before the trip and he was more than welcoming. He offered courtesy cars, use of the conference room, ground transportation, and anything else he thought we might need. Paul was not there that morning but the gentlemen on duty (sorry, I forgot his name) was equally friendly and welcoming. Hopefully he has fully recovered from his carpal tunnel surgery. 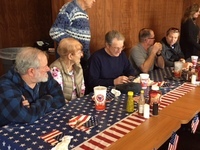 Thanks to Bob and Benjamin Thomas, Derek and Beverly Price, Dennis Guinn, Ned Howard, Tom Hubert, Dennis Mathis, and Robert McEnaney for participating in this fly out. Thank you for setting up our tour on Saturday, June 17th. We ended up with a few less people and one less airplane than originally planned but the ten (10) of us in our four (4) airplanes from Majors Field (KGVT), Majors Flying Club, and Caddo Mills (7F3) really enjoyed the tour and the hospitality. Wayne gave us a great tour and John, Buddy, and Linda showed us some excellent hospitality. Little things that contributed to the overall experience, over and above the magnificent airplanes, stand out like Buddy and John meeting us at the planes with ground transportation, and John taking the time to start all three of the courtesy cars and turn on the air conditioning to cool down the cars for us for our burger run to Herschel’s! You have a beautiful venue staffed by great folks. Our hats are off to you for the tribute the WWII side of the museum gives to our veterans. For those of you who made the trip Saturday, I don't think you were disappointed ! We saw some magnificent aircraft in almost pristine condition. The most notable point is that all the aircraft are flyable. The big disappointment is that the Corsair was not there but was at Breckenridge. Seeing those old airplanes with the round engines was eye-watering. The assortment of aircraft ranged from a tiny RV-3 to the B-25, "God and Country", a Douglas A-26B "Invader", a Ford Tri-Motor, an Albatross, a C-41 (DC-3) and a host of other bi-wing aircraft, some of which I was not familiar with. After the museum tour, we went to Herschel's Family restaurant and had a good time with the food and chatter. One thing for sure, if we go back to Herschel's we are NOT MOVING TABLES !!!! The 2nd quarter General Membership meeting was held on Thursday, May 25th and started around 1730 in the club hangar. Master Chef and club member Joe Rector had the grill going around 1700 and filled the place up with the delicious aroma of burgers and brats. Well done once again Chief Rector. 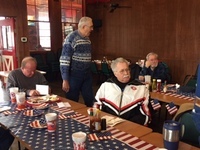 About twenty-five (25) people showed up to listen to our guest speaker and local aviation hero Mr. Harry Andonian. A small bit of club business preceded Harry's talk but it was a small price to pay for a burger and the chance to listen to Harry. The President, Mr. Dennis Mathis opened up the meeting with a few introductions. Treasurer Mr. B.J. Finney presented the Financial report (the club is in fair shape financially), Secretary Mr. Dennis Harwell may have said a few words, Mr. Mathis, in the absence of the Maintenance Officer Dennis Guinn, presented the status of the aircraft (both up and flying), and Vice President Denis Rottler presented a list of upcoming club events (see the Event Listings page on this website). Club member and flight instructor Mr. Don Reeder gave a nice safety presentation regarding the preparation and planning required for a cross country trip. Many small items are overlooked (drinking water, signalling devices, emergency blankets, first aid provisions, etc.) when planning a cross country trip. A lot of very useful and practical information was presented. Thanks Don. Two club members, Ned Howard and Tom Hubert, were recognized for obtaining their Private Pilot Certificate. 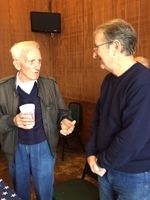 Dennis Mathis presented his student, Ned Howard with his framed Private Pilot certificate from the MFC and Don Reeder presented his student, Tom Hubert with his framed Private Pilot certificate from the MFC. Well done to both the new pilots and their instructors! Our guest speaker, Harry Andonian took the floor and ran through a presentation documenting his aviation career including multiple slides of all his military assignments, the hundreds of planes he has flown, and the thousands of hours in his logbook. The list of accomplishments on those slides is beyond impressive even without Harry saying a word. Harry entertained us with his F4 exploits and stories and graciously answered all of our questions. It is always a thrill to listen to Harry speak. For this presentation the MFC gave him a black glass engraved memento. Thank you Harry. The meeting was adjourned around 1900. Thanks for the folks who stayed around and helped clean up and put the hangar back in order. It is much appreciated. While the meeting and presentation are enjoyable, this part of the evening is really fun. With all the work completed, we almost always end up hangar flying for a while after the meetings. You can hear some really interesting stories, like stealing Navy P3 engines for example, at these after meeting sessions. All that was left was to close the hangar doors, turn out the lights, and divide up what remained of Mr. Gordon Hay's custom crafted Ghirardelli brownies. Those bad boys are dangerous! Thanks Gordon. The students of the 2017 Majors Flying Club (MFC) Private Pilot Ground School class have successfully completed the course and proclaimed in unison, "...let them eat cake!" As is the tradition the conclusion of the ground school is celebrated with a guest speaker, the grading of the End Of Course exam, the handing out their completion certificates, and the cutting of the special cake. The class this started year started on February 8th with twenty-one (21) registered students and as usual went for fourteen (14) weeks and was completed on May 10th with thirteen (13) students completing the course. The attrition is not unusual as work, family, and other life events typically impacts a small percentage of the students. Quite often however those affected students are able to complete the class the following year. This year, for the first time in the history of conducting these classes, we were not able to hold the classes on the same night of the week every week which added a level of scheduling difficulty for both the students and the instructors. Thankfully our President, Mr. Dennis Mathis, has resolved this issue for 2018. The resolution will allow all fourteen (14) sessions to once again occur on the same day of the week. In addition to being taught by several very experienced instructors over the course of the fourteen weeks, the MFC offers a short orientation flight to all interested members of the class as part of the package price. One member of the 2017 class has already been out for a pseudo flying lesson and at least one member has already passed the written FAA Ground School exam in preparation for starting flying lessons. Additionally in the last week of June 2017, two former ground school students (2015 & 2016) who are taking flying lessons through the MFC completed their first solo flights! It is never too late to get started learning how to fly. The classes for 2018 will start in February. Stay tuned to the website for details regarding the 2018 Private Pilot Ground School class. As you can tell from the pictures below Saturday, April 22, 2017 started out as a fairly blustery morning. The scouts enjoyed a thunderstorm on their Friday evening camp out (which turned into an inside event) and were greeted with some brisk north winds and cool temperatures on Saturday morning. You can also tell from the pictures of scouts in shorts and the adults in jackets and long pants which group received the weather memo. The Spring Scout Aviation Workshop for 2017 was another well attended and well run event. Around fifty-five (55) scouts attended as well as their Scout Leaders and some of their parents. The Scouts started their morning with an introduction to Harry Andonian, our local aviation hero, and were held spellbound in the FBO while Harry told them about his aviation career and shared several of his many flying stories. Following Harry's talk, the Scouts were assigned to a variety of airplanes in order to learn how to conduct a pre-flight inspection which was followed by demonstrating their newly learned knowledge by conducting their own pre-flight inspection. 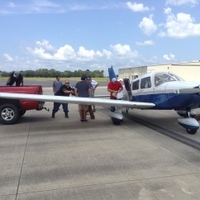 At the conclusion of the pre-flight event the folks in dispatch began assigning the scouts to the five (5) flying airplanes and after several sorties all of the scouts who were eligible to fly and who wanted to fly got a ride! The girl scouts who attended also participated in the pre-flight event and a map reading event although their rules do not allow them to go flying. As the scouts finished their flight they attended and built model airplanes to satisfy the requirements of the badge. 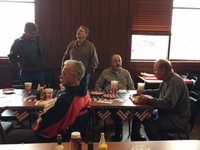 With the flights concluded, everyone including the pilots, the aircraft marshallers, the volunteers, the scouts, their leaders, and the parents enjoyed a Subway lunch compliments of the Scout troops. It takes quite a few volunteers to successfully orchestrate and conduct this event and the Majors Flying Club is very thankful to the folks who donated their time and airplanes to help make this event successful and safe for the scouts and to the skilled photographers who documented the event.